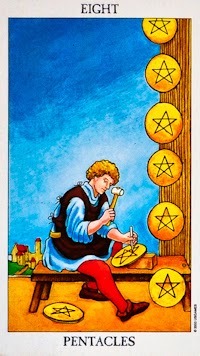 The Eight of Pentacles suggests you are working away at the finer details of the various aspects of your life, in an effort to continuously improve your situation. You may be unhappy with your current state and you know you need to make some important changes in your life to increase your overall satisfaction. This card is a really positive sign that you are committed to making those changes and to ensuring that you give yourself the best possible chance. Overall, this is a very hard-working and conscientious energy that is present in your life.